A two day training workshop was conducted on 26th and 27th of November with media professionals that took place in Khartoum Grand Villa with 40 participants (18 state members and 22 Khartoum members). 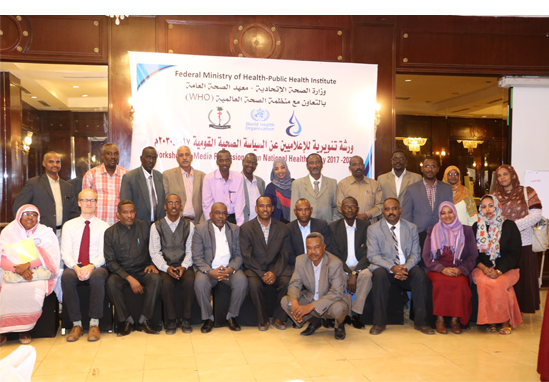 The objectives of the workshop were to orient and create a common platform of understanding of the concepts of National Health Policy, obtain the media sector commitment for the NHP through inviting important media figures, build consensus and ownership of the NHP among all media professionals and to advocate for the NHP in all media channels including TV, radio, newspapers, and other media channels. At the end of the workshop action plans were developed that will support advocating for NHP. The workshop encouraged communication means and helped to build trust between FMOH and media .